Ukrainian artist-designer Maria Volokhova was born in Kiev in 1980. Her broad creative interests led her to pursue a multi-faceted and very international education; embarking first on a Diploma of Fine Arts in Painting and Printmaking at Burg Giebichenstein University of Art and Design in Halle, Germany—during which Volokhova also spent time studying at the Accademia di belle Arte in Bologna, Italy in 2000 and 2001 and at Ohio University in Athens, U.S.A. in 2003—she completed her undergraduate training in 2004. She followed this up with a Masters in Fine Art from Burg Giebichenstein University, graduating in 2007. 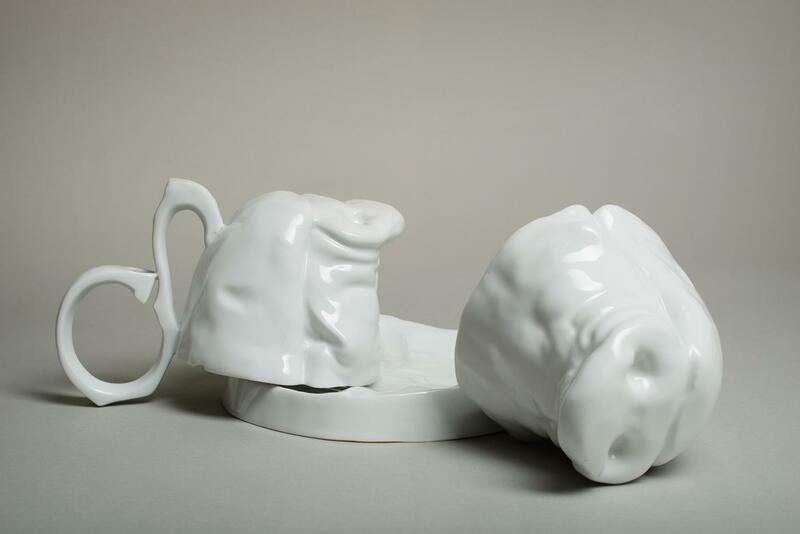 Concurrently, Volokhova began exploring her fascination for ceramics and from 2006 to 2009, she was a research student at Tokyo Art University (GEIDAI) in Japan. 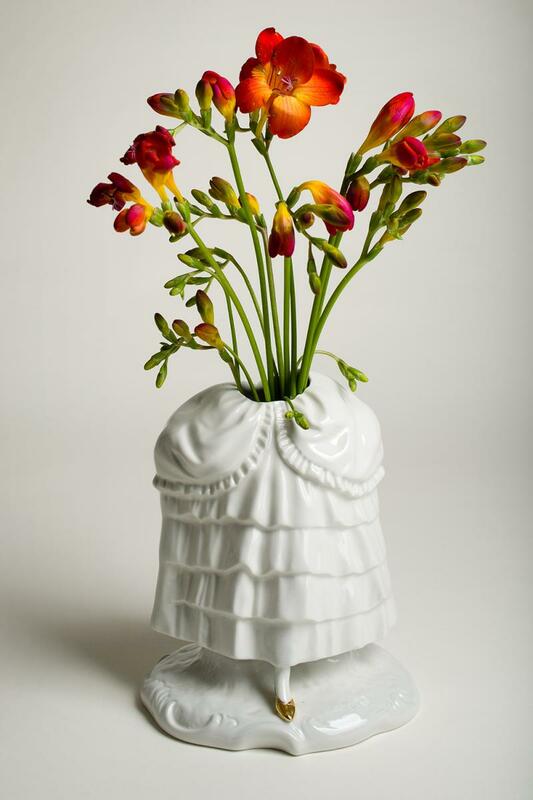 She then returned to Germany, settling in Berlin, where she founded her studio, Volokhova Porcelain, in 2010. Volokhova Porcelain inhabits very much the border territory between art and design—the functional and the figurative. 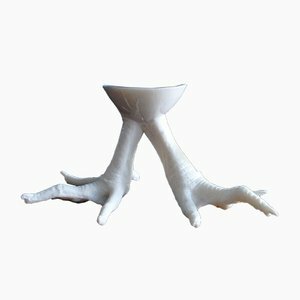 The work is memorable; pieces like the Coq En Páte egg cup, or the Sus Bonus lighting object hover between humor and a sort of monstrosity. There is an attention to detail and an intensity of expression in Volokhova’s work that seems perfectly suited to the medium of porcelain and its capacity to capture the finest intricacies of the designer’s hand and vision. 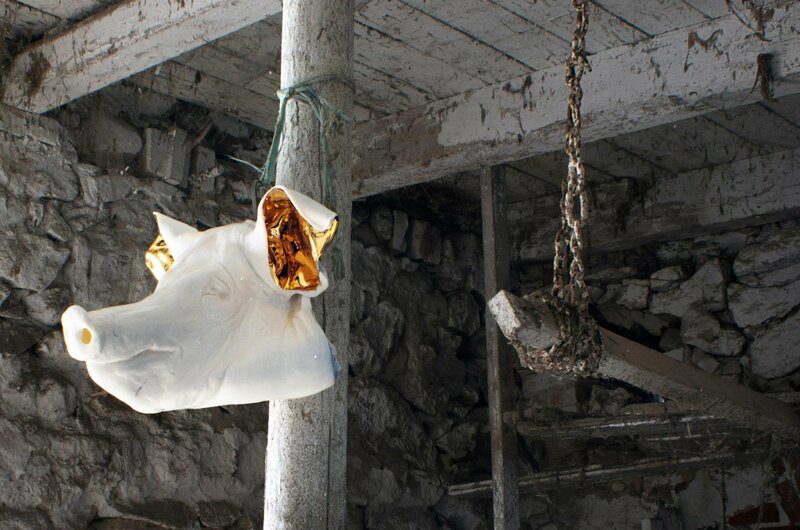 In the Pearlescence vase, Volokhova explores the territory between beauty and horror more explicitly, choosing as her subject the Monkfish, which is renowned both as a delicacy and for its ugliness. 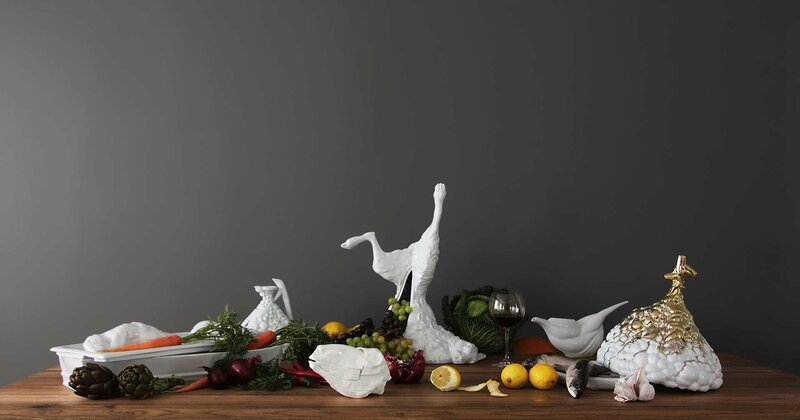 Rendered in pristine, white porcelain, Volokhova’s version of the fish moves beyond pure decoration and into something far more complex, conceptual, and engaging while retaining an elegance and refinement that would be at home in any contemporary interior. Demonstrating her strong connection to the world of fine art, Volokhova’s Still Life Stories is a series of tableware that draws upon Dutch still life painting from the 17th century; these classical motifs are reinterpreted in an utterly contemporary style, in a lust-worthy gold and white palette. Volokhova’s work has received numerous awards—including the prestigious Talents Design Award in Munich in 2007; the NASPA Prize in 2016; the Ceramics Prize Frechen in 2015; and, in 2013, the Ceramics Prizes in Diessen and Westerwald as well as the Richard-Bampi Prize, to name just a few—and has been exhibited widely internationally. 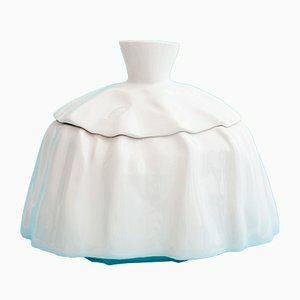 Due to the nature of her work, which is both polished and often functional, whilst also pushing forward the medium of ceramics in an innovative and conceptual manner, Volokhova has exhibited at high end design fairs and craft expos like the SaloneSatellite in Milan (2017, 2014, 2013), Venice Design 2016 as part of the Biennale of Architecture, the Porzellanbiennale Meissen (2016), New Crafts in Beijing (2015), and Maison&Objet Paris (2012), as well as in art galleries and museums like Kulturforum Berlin, Gallery Raumwerk in Munich, Walking Chair Gallery in Vienna, and the GIC Biennale in Korea, amongst many others. She has had partnerships with Reichenbach Porcelain and Kahla Porcelain, both in Germany, as well as being an artist in residence at the SANGO Ceramics Factory in Indonesia. Her work is included in the permanent collection of the Kunstgewerbemuseum in Berlin. Volokhova continues to live and work in Berlin.